Following lengthy hearings, a review panel last December recommended approving the project – a 1,177 pipeline network, proposed by energy company Enbridge, that would send 525,000 barrels per day of bitumen, the heavy oil from Alberta’s oilsands, to Kitimat, B.C. The panel recommended 209 conditions be attached to the project approval. “We urge you in the strongest possible terms to reject this report,” wrote the scientists, who are mainly from Canada and the United States. An inappropriate treatment of uncertain risks and a reliance on yet-to-be developed mitigation measures. Natural Resources Minister Greg Rickford, who has said the government will make a decision on the project soon, declined to comment about the letter. “That decision is before cabinet. We have no further comment,” Rickford told the Commons. The Harper government hasn’t directly or openly stated its position on the project, but it has generally endorsed the idea of building new infrastructure to support expansion of Canada’s natural resources, starting with an open letter signed by former natural resources minister Joe Oliver – who is now finance minister – in January 2012, that attacked environmental groups and accused them of conspiring to hijack Canada’s economy with foreign funding. Chan, who has a PhD in ecology and evolutionary biology, said the scientists are not trying to weigh in on the merits of the project, but instead are trying to highlight the “critical” mistakes made during the review that appear to downplay the risks. He added that these weaknesses in the review don’t necessarily mean the project must be stopped. Oliver’s 2012 letter kicked off an overhaul of Canada’s environmental laws that eventually led to the cancellation of nearly 3,000 environmental reviews of industrial projects in 2012. One month before the letter was released, his deputy minister at Natural Resources Canada, Serge Dupont, drafted personal notes that highlighted a strategy to “advance a strong and coordinated advocacy and communications plan, with early pre-positioning for legislative and other actions” to “frame dialogue” and open up access to new markets in Asia for Canadian oil resources. 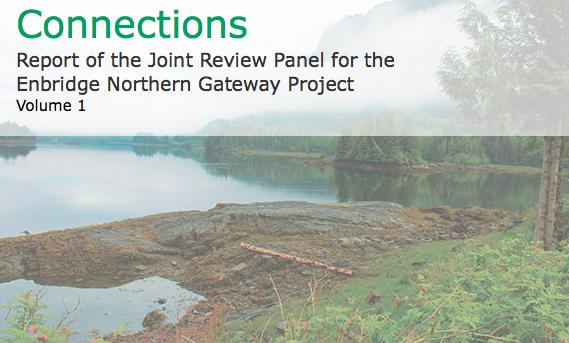 “Proactive policy and program measures could support Northern Gateway and future pipeline projects to west coast,” Dupont wrote in his notes. The oilsands are the fastest growing source of greenhouse gas emissions, the heat-trapping gases that contribute to climate change, in Canada. The Canadian government hasn’t introduced plans to slow down the oil industry’s pollution, even though its own estimates show that oilsands emissions growth would prevent Canada from meeting an international climate change commitment made by Harper. Enbridge says the project would create about 560 long-term jobs and about 3,000 during construction. But the project has also generated fierce opposition from First Nations communities and environmentalists, among others who say the economic and environmental risks of a catastrophe or long term damage outweigh the potential benefits. Also in the Commons Tuesday, both the opposition New Democrats and Liberals asked the government about the latest U.S. announcement to crack down on greenhouse gases from coal power plants, and whether Canada would follow up with regulations for its largest polluting industry – the oil and gas sector. Environment Minister Leona Aglukkaq pointed to the Canadian government’s existing regulations on coal, but declined to answer repeated questions about delays in delivering the regulations for oil and gas companies. The comments come one day after President Obama’s new ambassador to Canada, Bruce Heyman, stressed the importance of North American governments working together to tackle climate change. Heyman also said he was impressed at efforts he was seeing across Canada to produce energy and reduce environmental impacts, including a new partnership of companies operating in the oilsands; a carbon capture and storage project at a coal plant in Saskatchewan; a Nova Scotia wind mill tower that is creating jobs in an old rail car factory; and Hydro Quebec’s operations as well as its energy distribution in the U.S.
“These examples demonstrate it is not energy OR the environment, but energy AND the environment,” Heyman said. This entry was posted in oil and gas and tagged Barack Obama, bitumen, Bruce Heyman, Canada 2020, climate change, Enbridge, greenhouse gas emissions, Greg Rickford, Joe Oliver, Kai Chan, Natural Resources Canada, Northern Gateway, Obama administration, oilsands, pipelines, Serge Dupont, Stephen Harper, tarsands by Mike De Souza. Bookmark the permalink. Thank you for this information. We need to raise our voices louder and louder. I’m glad you covered this initiative. I’m enjoying reading your blogs.